Want to build a combo with your Guytronix tube amp kit? Don’t want to use an extension cab? 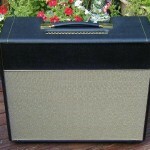 Not interested in finding and re-purposing a “donor amp”? The made-to-order Guytronix Combo Cabinets are offered not only as a ‘gussy-up’ for your Gilmore Jr. and Ardmore Kits, but also play a very significant role in support of your amps’ tone. Only top-notch materials are used throughout.